Professor Mahendhiran Nair, Vice President (Research & Development), Monash University Malaysia and Chief Executive Officer, Monash Malaysia R&D Sdn Bhd has been elected as Fellow of the Academy of Sciences Malaysia (ASM), the nation’s Thought Leader in matters pertaining to Science, Technology and Innovation (STI). 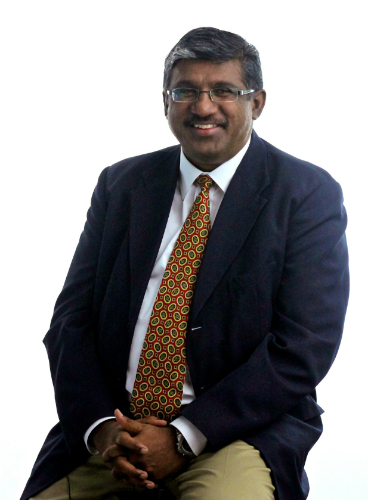 Professor Mahendhiran was elected under the Social Sciences and Humanities area for his high impact research publications and translational research work for government agencies, industry associations, industry and community organisations in the areas of STI and sustainable economic development. He is also the fourth Professor from Monash University Malaysia to have been elected as a Fellow of ASM. Stating that it came as a surprise to him, Professor Mahendhiran shared that he was nominated based on the work he does: “I’m trained as an econometrician and data scientist. A lot of the work I do is developing empirical models to understand economic phenomena and behaviour. Over the years, I’ve been working on empirical models that measures the impact of STI outcomes on socioeconomic development in developing countries. Besides publishing the work in good journals, I’ve had the chance to lead major research projects for key public policy agencies and ‘think-tanks’ in the country”. On the community level, Professor Mahendhiran has spearheaded projects on technology adoption and the use of innovative financial models among the poor and marginalised communities. “I am humbled by this experience and through ASM, we (Monash University) can play a broader role in the scientific community and partake in work that is important for Malaysia and the region, and also work with teams of scientists and scholars in the country and the region to undertake multidisciplinary and interdisciplinary research initiatives that are strategic to the development of the region”. We would like to congratulate Professor Mahendhiran Nair FASc for being one of the 325 Fellows of ASM and one of the 7 Fellows in the Social Sciences and Humanities area. ASM was established under the Academy of Sciences Act 1994 and was officially inaugurated by Prime Minister Tun Dr Mahathir Mohamad on Sept 8 1995, who is also one of its six honorary fellows. * To be a thought leader. * To be an Apex Advisory Body on STI matters. * To be an effective promoter of public understanding and awareness of STI.